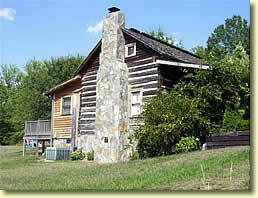 The house in which R. R. Haynes was born (as it stood at its third location, in Cliffside Estates, summer 2002). Photo by Grover Haynes, Jr.
On Friday, February 17, 2006 the old log house in which R. R. Haynes was born in 1851 was moved once more, this time to “downtown” Cliffside. Some years ago the little cabin was moved from its original location in the Ferry community to a space beside the home of R. R.’s great-granddaughter, Janice Bridges Swing, in Cliffside Estates. Now that Janice and husband Marc are developing a large swath of land in old Cliffside, and are building their own new home on Main Street, the logical place for the cabin would be near their new house. And that’s where it arrived on Friday afternoon. This gallery of 20 photos, taken by John Fisher, Neal Hunter and Janice Swing, follows the progress of the move, from Cliffside Estates to 30 Main Street. The moving crew gently placed the entire cabin, in one piece, onto a big flat-bed trailer, which then crept out onto Washington Street, and took a right on highway 120 toward the school house. All along the route, the men had to dodge and wrestle tree limbs out of the way. Many of the students at Cliffside School gathered on the school steps to view the passing parade. Finally the unusual cargo was maneuvered into place behind the new Swing house, which is close to completion. The pace of Cliffside may seem slow, but downtown has now seen TWO dwellings erected in this new century, and it’s only 2006!